Climate change is affecting many parts of the world (e.g. 2016 has been the warmest year globally, oversupply of water in California, record drought conditions in India, etc.). Our profession is one that deals with the food-water-energy-environment nexus and we are challenged to find innovative solutions for the increasing global population under these climatic conditions. This scenario presents plenty of challenges for CSBE members to deal with, which can lead to contributions not only locally but nationally and internationally. Our call for proposals for the Annual Meeting in Winnipeg (August 6-10, 2017) has been well received by members of the CSBE and CIGR. We are looking forward to a great conference wherein sustainability is the underlying theme. If you have not yet submitted your proposal, you can still do so before the closing date which has been extended to next week. March 15th is the deadline for submission of the nominations of deserving members for many awards, and also for the Fellowship of the CSBE. Please take interest in doing so. The Prime Minister of India, Narendra Modi, is allocating resources to finding ways to doubling the income of farmers in the near future. The size of the Indian farming community is 650 million people. The Indian Society of Agricultural Engineers (ISAE) has invited CSBE to look into this challenge. This would be an excellent opportunity for our engineers and scientists to link up with colleagues in India. This brings me to share the next meeting date of the ISAE which is January 8-10, 2018 to be held in Anand, Gujarat. As I reported to you in the last newsletter, undergraduate and graduate students are very enthusiastic about the future of CSBE, and they are working hard to be part of this society to make it sustainable for decades to come. I am hoping that you all had a great start to 2017, and I wish you a wonderful rest of the year. P.S. The Water Conference which is part of the global initiative of the ASABE will be held in October 2018 in Hyderabad, India. Les changements climatiques touchent de nombreuses régions du monde (par exemple, l'année 2016 a été la plus chaude au monde, les précipitations record d'eau en Californie, les conditions de sécheresse record en Inde, etc.). Notre métier est celui qui traite du lien entre l'alimentation, l'eau et l'énergie et nous sommes appelés à développer des solutions innovatrices pour la population mondiale croissante dans ces conditions climatiques. Ce scénario présente de nombreux défis auxquels les membres du CSBE doivent faire face, ce qui peut entraîner des contributions non seulement au niveau local, mais aussi national et international. Notre appel à propositions pour la réunion annuelle à Winnipeg (6-10 août 2017) a été bien accueilli par les membres de la CSBE-SCGAB et de la CIGR. Nous nous attendons donc à une grande conférence dans laquelle la durabilité est le thème sous-jacent. Si vous n'avez pas encore soumis votre proposition, vous pouvez toujours le faire avant la date de clôture qui a été prolongée à la semaine prochaine. Le 15 mars est la date limite pour la soumission de nominations de membres à de nombreux prix et distinctions, ainsi que pour la bourse de la CSBE-SCGAB. Merci de prendre le temps de soumettre la candidature de l’un de vos collègues. Le Premier ministre de l'Inde, Narendra Modi, alloue des ressources pour trouver des moyens de doubler le revenu des agriculteurs dans un proche avenir. La taille de la communauté agricole indienne est de 650 millions de personnes. La Société indienne des ingénieurs agricoles (ISAE) a invité la CSBE-SCGAB à s’intéresser à ce défi. Ce serait une excellente occasion pour nos ingénieurs et scientifiques de se relier à des collègues en Inde. Cela m'amène à vous partager la prochaine réunion de l'ISAE qui se tiendra du 8 au 10 janvier 2018 à Anand, Gujarat. Comme je vous l'ai signalé dans le dernier bulletin, les étudiants du premier cycle et des cycles supérieurs sont très enthousiastes à l'égard de l'avenir de la CSBE-SCGAB et ils travaillent fort pour faire partie de cette société pour la rendre viable pendant des décennies. J'espère que vous avez tous eu un excellent début d’année 2017 et je vous souhaite une excellente continuation. P.S. La conférence sur l'eau, qui fait partie de l'initiative mondiale de l'ASABE, se tiendra en octobre 2018 à Hyderabad, en Inde. The Local Arrangements Committee (LAC) continues with plans for the upcoming joint conference in Winnipeg (August 6-10th). In excess of 160 abstracts have been submitted so we are looking forward to excellent technical content. There will be a good mix of oral presentations and posters covering a wide diversity of topics that should be of interest to members of both CSBE/SCGAB and CIGR. Special sessions have been organized by CIGR members on the topics of “functional foods, nutrition and the consumer” and “safety of traditional and non-traditional sources of protein”. In addition to these technical presentations, the LAC has arranged approximately a dozen keynote and invited speakers to provide general-interest morning sessions for conference delegates. Speakers include a combination of industry leaders, government officials, and university researchers. Keynote/invited speakers will speak on the topic of “biomaterials (or fibre)” on Monday morning, “food” on Tuesday morning, and “innovation” on Wednesday morning. A workshop entitled “Teaching and Learning with Technology” is planned for Sunday afternoon, with tours of several University of Manitoba facilities planned for Thursday morning (Richardson Centre for Functional Foods and Nutraceuticals, Canadian Wheat Board Centre for Grain Storage Research, Alternative Village, Manitoba Institute for Materials). A Reverse Career Fair will be planned to enable excellent networking opportunities for student members. Watch the conference website for details of the technical program as they become available (www.csbe-scgab.ca/winnipeg2017). Online registration opens on April 1st with early bird registration rates in effect until June 15th. I believe that CSBE student organizations have become complacent. This is emphasized in the continuing decline in student membership, retention of student members post-graduation, and the diminishing of bioengineering programs across Canada. At the University of Manitoba, the CSBE Student Chapter realizes that our future success in industry and academia depends upon our ability to eliminate two essential stigmas that have been ignored in our complacency. The first is the ever persistent “what is bioengineering?” that hits students at almost every career fair, and industry interview we attended. The second is a perspective held by some prospective engineering candidates and prospective CSBE recruits. This perspective is that bioengineering is only a second choice engineering department. To tackle these perspective the team at the University of Manitoba has worked diligently with full fledge CSBE members to pave the way to a revitalized student group. Our objective is to help bioengineering student’s transition from academia into industry and to promote long term membership with CSBE. To achieve these objectives we have set our sights on developing and maintaining mentorship programs, e-portfolios, and intensive industry relevant workshops. I will briefly highlight what we propose in each of these domains. 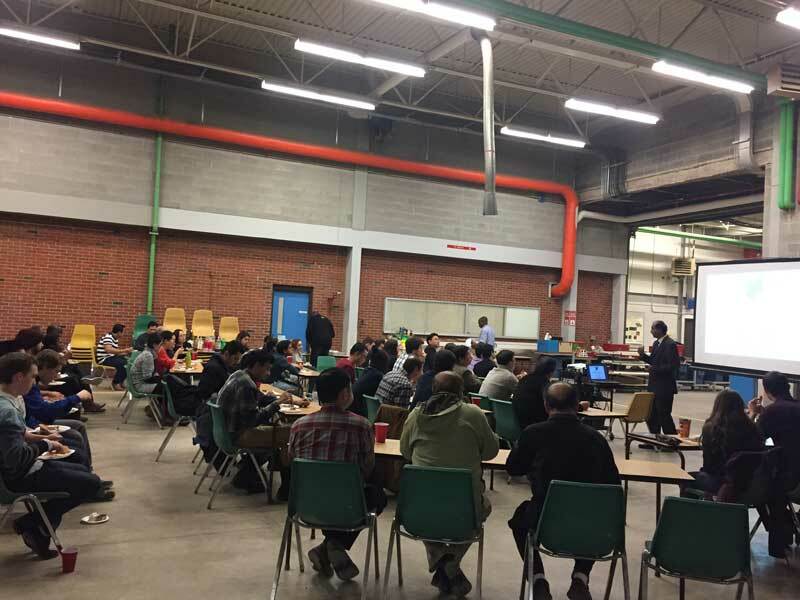 Mentoring, as we see it, is a chance to allow industry to develop lasting ties with students at the University of Manitoba and to afford practising engineers the opportunity to earn professional development credits. It is also a means for us to continue our affiliation with CSBE upon our own graduation. The development E-portfolios can supplement our student body’s ability to succeed by highlight work experience, academic achievements, and co-curricular activities. Many of us complete rewarding work over a term and would benefit from an opportunity to share these experiences with colleagues, employers and mentors. The goal for intensive industry workshops is twofold. First, we aim to use the many resources at the University of Manitoba to fortify skills essential to engineering. These can include technical skills in circuit design, welding, machining, microscopy as well as professional development workshops and maybe even a speaker’s series devoted to research accomplished by professionals at the University of Manitoba. The second goal is to open up these workshops to industry to serve as professional development credits and an opportunity for industry to network with students and professors. I’d like to end this perspective with a glance of the ground we have gained so far. In this past year, we have developed a brand new student constitution, fortified our connections with our academic partners at the University of McGill and with full fledged members of CSBE, and helped developed speaker gifts for this year’s CSBE conference. These efforts have allowed us to generate proposals which will, hopefully, allow us to bring students from McGill to the CSBE conference in Winnipeg this summer and have allowed us to contribute meaningfully to the society at large. These goals and accomplishments highlight how we have been working together to end the complacency that afflicts CSBE Student groups. BLE Ph.D. student Robbarts Nongmaithem was awarded travel bursary from International Student and Study Abroad Centre, U of S to visit NIFTEM (National Institute of Food Technology Entrepreneurship and Management), Government of India during October-November 2016 where he presented a seminar to the UG students in Food Science and Technology program and interacted with the faculty and graduate students. This ongoing collaborative effort is part of an International MoU between NIFTEM and U of S led Dr. V. Meda, Chemical and Biological Engineering. 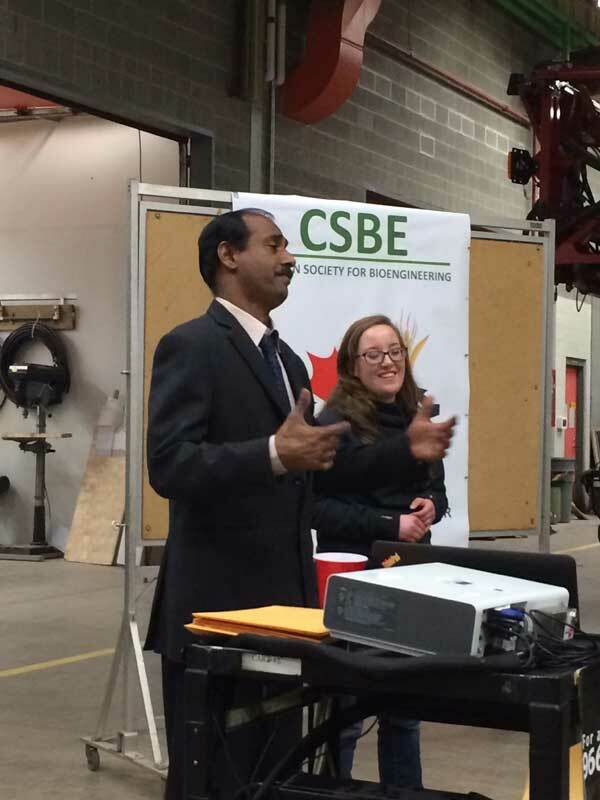 The second CSBE Information Night was held in the Hardy Lab of the Engineering Building at the University of Saskatchewan (U of S) on March 10, 2017. 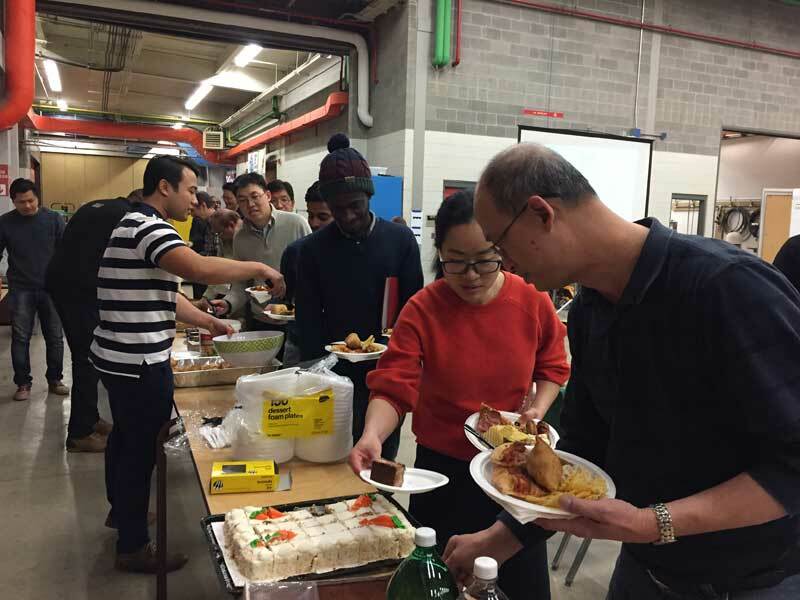 The main goal of having the event was to introduce CSBE to new and existing graduate students in Chemical, Biological, and Environmental Engineering as well as to have pleasant networking with delicious foods. 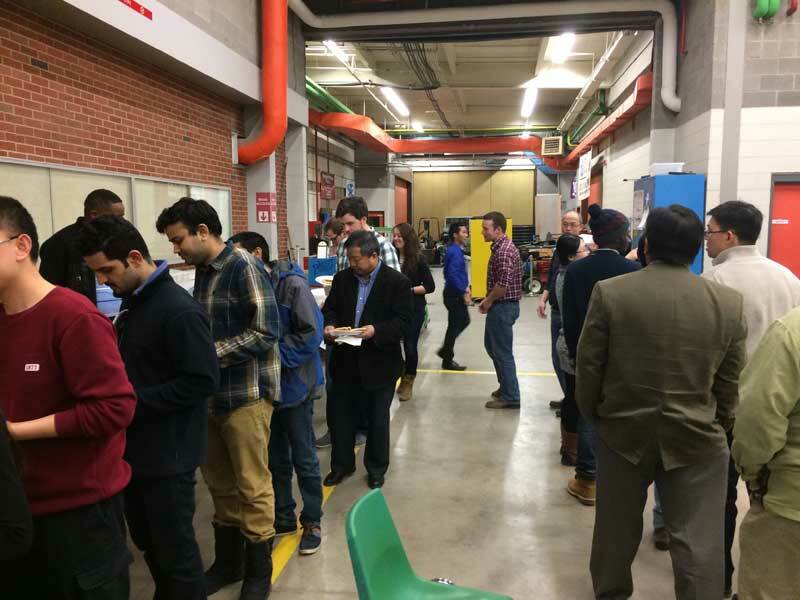 Graduate students, faculty and staff in Chemical, Biological and Environmental Engineering at U of S were invited and more than 50 people showed up in the event. The Vice-President (technical) of CSBE, Dr. Venkatesh Meda gave a presentation about CSBE for half an hour. The presentation included the multi-disciplinary scope of CSBE and career opportunities in the field of agriculture, food, Bio-systems, chemical, and environmental engineering including benefits as a CSBE member. After the CSBE introductory presentation, Alison Graham from Seed Hawk Inc. made a short presentation on Young Professionals Community (YPC) of ASABE. She emphasized the opportunities and benefits from participating in YPC. Most importantly, people enjoyed pizza, chicken wings, snacks, cake and drinks very much in the nice Friday evening. The program started at 4:30 pm and ran for around two hours.